Examining Vendée Globe boats on the dock in Les Sables d’Olonne prior to the start of the race last November, one thing was perfectly clear: the genie is out of the bottle when it comes to foils on monohulls. All six of the new generation International Monohull Open Class Association (IMOCA) 60s competing in the latest edition of the vaunted solo round-the-world event were equipped with exotic “Dali foils” (so-called by their designers, Van Peteghem Lauriot Prévost (VPLP)-Verdier, after the Spanish artist’s swoopy mustache) that jutted menacingly out of the hulls and required extra-big fenders to keep clear of pontoons. There was also one older boat, Maître CoQ, that had been retrofitted with very similar appendages. Foils like these were expected to boost performance by margins of up to 10 percent, a significant leap in the yacht-design game, where gains of 2 or 3 percent are normally hard won. And the race results were not disappointing. The four top finishers (Banque Populaire VIII, Hugo Boss, Maitre CoQ and St. Michel-Virbac, in that order) were all foilers. Two others (Gitana/Edmond de Rothschild and Safran) were at the front of the fleet before being forced to retire. The only foiler doing poorly, No Way Back, was skippered by a Corinthian rookie who lacks the experience to press his boat hard. The question now is where do we go from here? In answering that, it’s important to remember there’s nothing optimal about the foils on this latest crop of IMOCA hot-rods. These were not boats designed around their foils; rather these were foils that were grafted onto the existing IMOCA 60 template. In large part that was a function of the rules of the game. IMOCA limits its boats to five appendages—normally two rudders, a keel, plus two others, be they daggerboards or whatever. 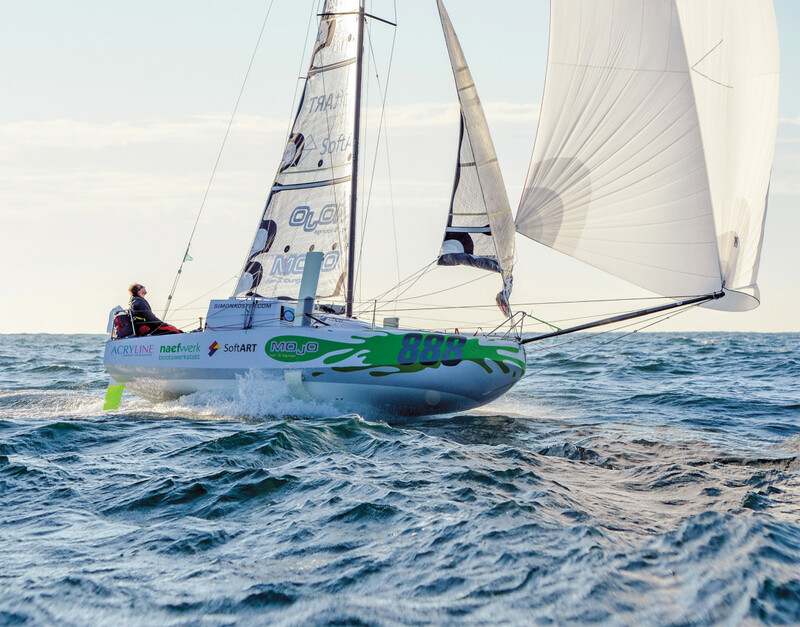 Importantly, IMOCA ruled that a single horizontal foil that can slide out either side of the boat, as with British designer Hugh Welbourn’s Dynamic Stability System (DSS) foil, must count as two foils. So it wasn’t possible to have separate sets of appendages to resist leeway and create vertical lift, as on the famous “Swiss Army knife” maxi Wild Oats XI, which carries a horizontal DSS foil, plus two vertical daggerboards (and even a canard up front), and was the first big monohull with foils to make a name for herself back in 2014. The last revision of IMOCA protocols also imposes a draconian regime of heavier one-design rigs and keels on new builds, in the interest of safety and restraining costs. Wealthy IMOCA teams with money to burn on new builds inevitably seized on foils as the best way to game these restrictions, but in a high-profile, high-cost contest like the Vendée Globe, none were willing to take a chance on an all-new purely foil-based design. Instead of daggerboards they put carefully sculpted Dali foils on super-wide IMOCA hulls with canting keels and relied on the foils to do both jobs: create vertical lift and resist leeway. The result was something of a mashup. The latest IMOCA 60s may be faster than their predecessors when reaching and running in moderate to strong conditions, but they cannot point as high and are draggier in light conditions when boatspeeds aren’t high enough for their foils to become effective. Only in a race like the Vendée Globe, which features lots of breeze and little windward work, could boats like these be cutting-edge competitive. 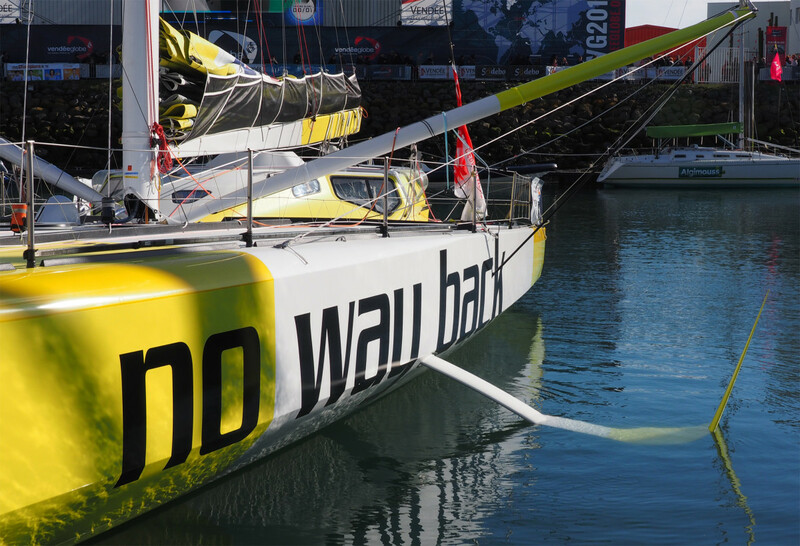 Tellingly, the only Vendée team pushing the envelope was Alex Thomson’s. With input from Hugh Welbourn, Alex Thomson Racing created its own set of DSS-inspired Dali foils, which are more horizontal than those on the other boats, with a convex rather than concave curve in the shaft. To complement these, they also asked VPLP-Verdier to draw a hull that was narrower than the others. Hugo Boss certainly seemed to be the most powerful boat early in the race, as Thomson quickly grabbed the lead and came just a few meters shy of setting a new solo monohull 24-hour record before losing his starboard foil in a collision. Later, during his final run up the Atlantic while sailing on his remaining foil, he did succeed in setting a new record, covering 536.81 miles in 24 hours. That he was able to hang on to second place in spite of losing one foil might be due to his boat’s superiority. Or it might be a testament to his skill as a sailor. Or it might suggest that the foils on this generation of boats are a bit more superfluous than they should be. 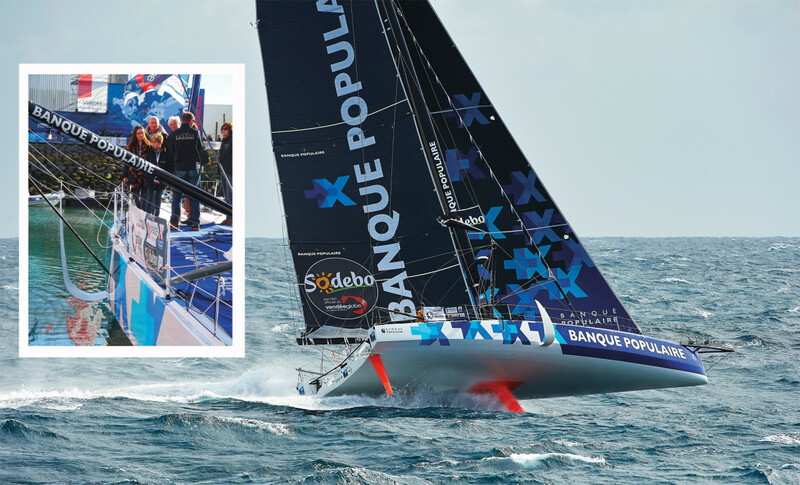 The best evidence that foiling monohulls truly are here to stay came just a month after the Vendée Globe start when Beneteau introduced its new Figaro 3 design, drawn by VPLP, at the Salon Nautique de Paris in December.  This represented a huge commitment by one of the world’s biggest boatbuilders. The one-design Figaro class is absolutely seminal in solo offshore racing, the hotbed where young talent emerges and established stars hone their chops. For Beneteau to plant the foiling flag on its third generation of these series-production boats means for a decade at least foils will define the experience of most sailors seeking to excel in solo distance racing. Where the first two generations of Figaro boats were fairly conventional performance designs, the Figaro 3 is something else entirely. The focus is still on durability and affordability, and the new boat will have a simple foam-cored fiberglass hull, a fixed keel, and a carbon-fiber rig. 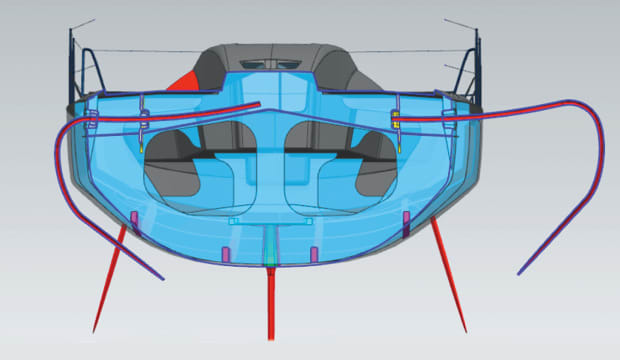 But instead of heavy water-ballast tanks to boost righting moment, the new Figaro boats will rely on unique inverted curved foils sprouting from foil cases set high above the boat’s waterline. 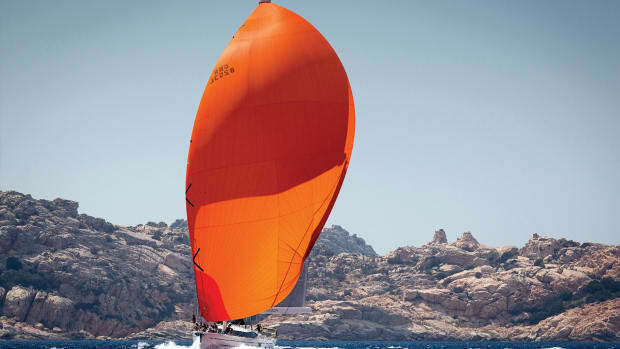 Like the exotic Dali foils on the IMOCA boats, these new Figaro foils are expensive, complex structures. 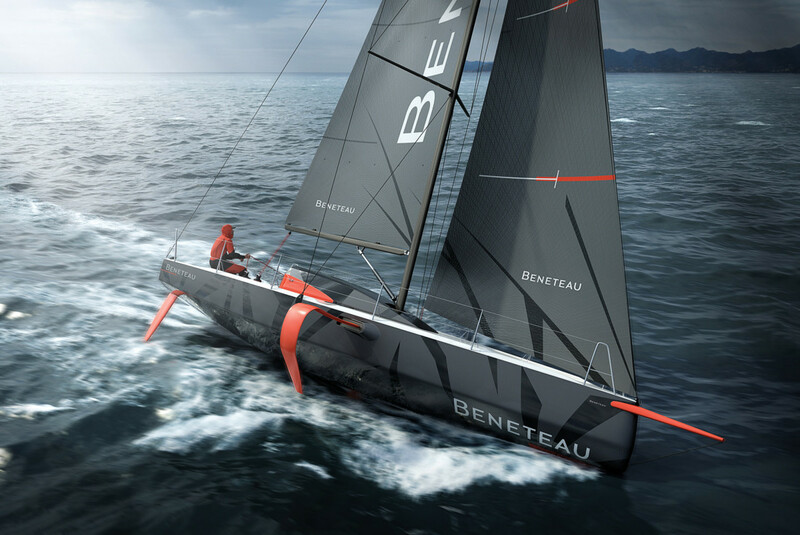 The deeply curved foils and the cases supporting them, according to Beneteau’s sailboat marketing director, Gianguido Girotti, will represent almost a third of the cost of the boat. Like the IMOCA foils, the Figaro foils will also do two jobs at once, creating vertical lift and resisting leeway. Unlike IMOCA foils, however, the Figaro foils will be getting a lot of help in the leeway department from the boat’s fixed keel. As Girotti explains it, the foils allow for surface area to be pared away from the keel, and the two appendages thus complement each other. The foils also save a lot of weight, with the target displacement for the new boat being 6,400lb, about 440lb lighter than the Figaro 2. The inverted orientation of the new Figaro foils may seem counterintuitive in that the main foil shafts are too elevated to spend much time immersed in water. Instead, most all the work of generating lift will be done by the curved foil tips. In fact, according to Girotti, Beneteau did look at a number of more conventional monohull foils, like the IMOCA Dali foils and the DSS foil. But it concluded that a small boat like a Figaro, just 32ft long, wouldn’t normally generate enough speed to overcome the drag created by these larger surfaces. Still, the impact of the foils should be significant. With 14 knots of boatspeed, VPLP estimates the foil tips will reduce the Figaro 3’s effective displacement by almost 900lb and will increase overall speed by 15 percent. The inverted Figaro foils also offer more prosaic advantages: like the fact that if they are torn away and their cases damaged, the damage will be high enough that the hull’s integrity won’t be immediately compromised. Similarly, the curved foils when retracted can be pulled tight against the boat’s topsides and kept within its maximum beam. 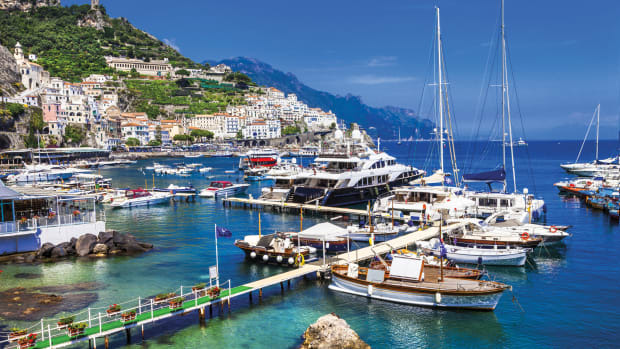 In large Figaro fleets this is an important logistical consideration, notes Girotti, particularly on crowded start lines and in crowded marinas. According to Girotti, the first Figaro 3 prototype will launch in June and series production should begin in September. The new boats will make their racing debut in 2019. Final pricing has yet to be determined, but the target is to come in under $215,000. While Beneteau does expect the Figaro 3, a Category A ocean-rated boat, will be raced outside the Figaro circuit, Girotti said the French builder isn’t yet committed to introducing foils on any of its mass-production models. 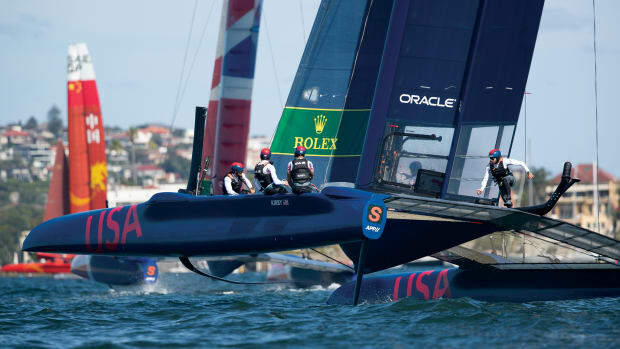 Of course, the definitive question of whether foils can generate enough lift to actually fly a ballast-keel monohull was answered when the Quant 23, a scow-hulled sportboat with a pair of curved DSS foils, went airborne in 2015. That same year the Quant 23 won a European Yacht of the Year Award and has since been followed by larger sisters, the Quant 28 and 30. 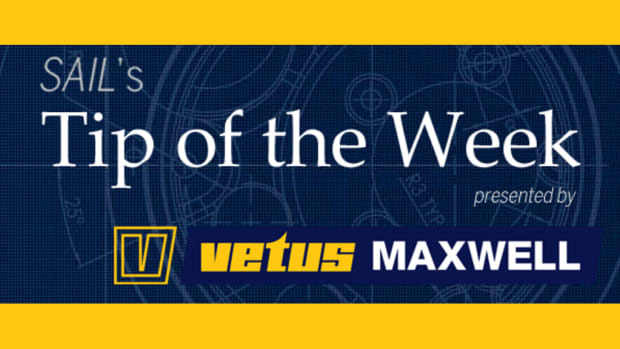 Welbourn believes keeping foils simple is the best guiding principle and is dismissive of the notion of putting on complicated flaps or elevators so as to fine-tune their performance. He also doesn’t like the idea of asking foils to resist leeway as well as generate lift and is deeply skeptical of the extreme angles seen on the new IMOCA and Figaro 3 foils. The complex shapes, he says, greatly increase the risk of damage due to twisting loads on foil tips. As an example of this, he points to the fate of Gitana in the current Vendée Globe, where a retracted foil was so badly damaged as the boat fell off a wave that skipper Sébastian Josse was forced to retire. He believes tip-induced twisting loads may also have contributed to the loss of Hugo Boss’s foil. Then there’s the matter of costs. Just one set of IMOCA Dali foils costs something like $400,000, and teams can expect to build multiple sets as they fine-tune designs. 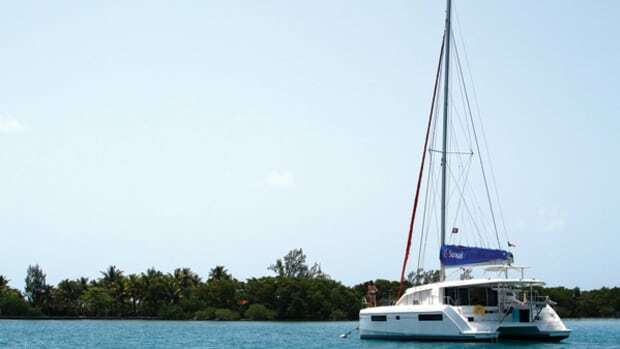 Even on much smaller boats, as on the Figaro 3, exotic deeply curved foils can cost more than the sails and rig. A standard horizontal DSS foil, by comparison, represents only a small fraction of a boat’s total price tag, and according to Welbourn’s partner, Gordon Kay, who runs Infiniti Yachts, is effectively cost-neutral, because the extra righting moment created by the foil leads to savings in construction expenses, since the boat itself can be built lighter, with less ballast and a smaller rig. Though DSS foils, for the time being at least, have effectively been turfed out of IMOCA, Welbourn and Kay are working on a number of other projects, several of which they can’t presently discuss, a welcome change after years in the wilderness. One they can discuss is the new Flo1 foiling dinghy, just introduced by the Dutch firm Aeronamics, which should help get more novices interested in foiling monohulls. This carries a pair of gently curved DSS foils, a daggerboard, a single sail, and goes airborne, but should be much more user-friendly than the twitchy Moth. 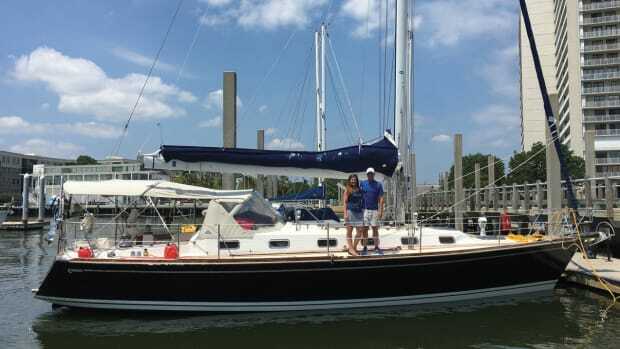 With a hull weight of just 100lb, an introductory price of less than $9,000 and an ability to foil in less than 8 knots of breeze, there should be lots of average sailors willing to give the Flo1 a try. On a much grander scale, DSS foils are also continuing to carve their way into the status quo. For example, according to Welbourn and Kay, there’s a DSS foil going onto a large superyacht currently in build, while Maverick, the first Infiniti 46R, with a canting keel and twin DSS foils, has begun the job of introducing monohull foils to IRC and ORC racing. With a Corinthian crew aboard she won her class and took second overall in the Rolex Middle Sea Race in October, then followed up by taking second overall in the RORC Transatlantic Race in December. As we go to press she was gearing up for the Caribbean 600. More recent Infiniti projects have seen Farr Yacht Design coming aboard as a partner. These include the Farr-designed Infiniti 53, a svelte IRC offshore racer that can be ordered with a fixed or canting keel. There’s also an exciting performance bluewater cruiser in the works, the Farr-designed Infiniti 56, which features a transverse DSS foil set beneath its cabin sole and a cruise-worthy lifting keel for getting into shoal water. 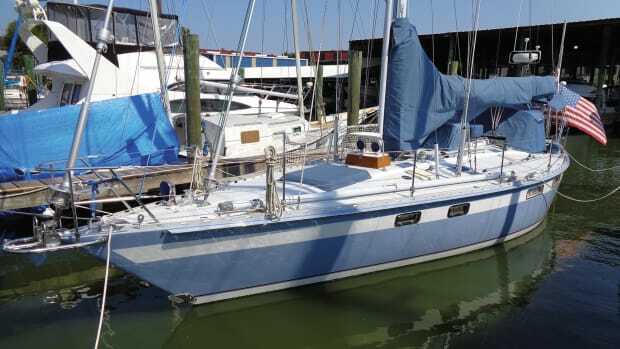 With a deck saloon, a full galley, and three generous staterooms, all with ensuite heads, this is a boat in which a laid-back family crew could easily steal line honors in the ARC. The Mini 6.50 Prototype class is renowned as a seedbed of design development, so it’s not surprising someone has thought to put foils on one of these 21ft thoroughbreds. The first to launch and race a Mini with foils was Swiss sailor Simon Koster, who graduated from the “Series,” or production, class to the cutting-edge “Proto” class in 2015 and was determined that his new boat, Eight Cube, dubbed “the Flying Frog,” would push as many boundaries as possible. Developed by Michel Desjoyeaux’s design firm Mer Forte, the scow-bowed Frog was about as complicated as a 21ft boat can be. In addition to the lifting foils, set well outboard on either side, there were twin T-foil rudders, plus a telescopic canting keel that could also rotate to improve its angle of attack. Under class rules at the time, no protrusion on a Proto boat could exceed the max beam of 3 meters, so the tips on the Frog’s vertical foils were canted inward, as on a foiling catamaran. The rake of the foils could be adjusted with a line-controlled worm drive, allowing the amount of lift they generated to be fine-tuned. Likewise, the rake of the rudders could be altered by inserting or removing spacers in their mounting brackets. It may be the Frog was a bit too complicated, as Koster finished in the middle of the 2015 Mini Transat fleet and reported he was still learning to sail the boat while racing. He also reported his foils started working at 10 knots of boatspeed and were optimal at 14. At this point, it’s believed they were generating over 1,100lb of lift, or about 60 percent of the boat’s 1,800lb displacement. Interestingly, Hugh Welbourn also developed a Mini Proto design for French sailor Dom Pedron that attacked the problem of foils on a Mini from the other way around. Instead of putting vertical foils with inverted tips on a wide boat, Welbourn drew a very narrow boat with a horizontal DSS foil sprouting out the sides. Pedron actually built the boat, but it never campaigned. Since then the Mini class rules have changed and are friendlier for foils. Foils, when housed, must be within the old 3-meter beam limit, but when deployed can sprout out to a max beam of 6.5 meters. As the Proto fleet gears up for this year’s Mini Transat, there are rumors at least three different Protos are being retrofitted with foils and that Eight Cube is being modified. As we go to press, one retrofit team, SEAir from France, went public and displayed images of David Raison’s famous 747 Mini, the first Mini scow design, flying on adjustable foils with a four-axis control unit. These exceed the new class beam limit but could be trimmed to comply with the rule. SEAir reported the boat was only being tested and there is no immediate plan to make it class-legal.